Taxify is a sales tax automation platform designed for eCommerce businesses and online retailers. It aids small to medium-sized businesses calculate their sales taxes and file their sale tax returns effortlessly. In addition, Taxify helps users respond to changes in sales tax laws and enables them to comply with such laws efficiently. Taxify provides users with the most up-to-date sales tax rates for every state or local jurisdiction. Users can also access ready-to-print and ready-to-sign tax forms, enabling them to facilitate and streamline their tax filing and reporting obligations. To help them prepare for audits, the sales tax platform allows them to access past transaction reports as well as their current tax filings. In addition, Taxify provides users with the capability to automatically file their sales tax returns in every state and remit the sales taxes they owe. The platform also offers a self-service web portal which they can use if they want to seek assistance and advice from Taxify’s customer support team. The platform supports integration with shopping carts, marketplaces, accounting software, point of sale systems and apps. Last but not the least, Taxify offers online resources that guide Amazon sellers to comply with sales tax laws and regulations. Taxify is a sales tax platform which is exclusively built for eCommerce businesses. It assists users who are managing online stores and running their businesses through online marketplaces. Taxify makes sure that their business is protected as federal and state tax laws change, enabling them to be aware of their tax liabilities and comply with such laws. 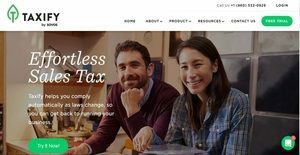 To help online retailers and eCommerce business owners comply with sales tax laws, Taxify provides online resources that they can access or download from the platform. As an example, it has an eBook which is created for Amazon sellers. This eBook provides Amazon sellers with step-by-step guides so they can quickly comply with sales tax laws. Taxify also provides a discussion about sales tax nexus which is prepared for sellers who are using Amazon’s program called Fulfillment by Amazon (FBA). This program allows online sellers to store FBA inventory to Amazon’s fulfillment centers located in different states as they ship items or products to their customers. Nexus is actually a legal term that requires sellers to collect and pay sales taxes as they do business in a particular state. The placement of products or inventory in that state serves as the legal basis for a sales tax nexus. However, tracking of FBA inventory across Amazon’s fulfillment centers and locations is a challenge for online sellers. Since Amazon doesn’t provide historical details as it moves FBA inventory across different states and locations, online sellers have to implement ways so they will be able to determine their tax liabilities and comply with sales tax laws. Taxify enables users to access online resources such as this in order for them to be aware of their tax obligations and be compliant with sales tax laws and regulations. Meanwhile, Taxify offers users the capability to access up-to-date sales tax rates in real time for every state or local jurisdiction. It can provide real-time sales tax rates in more than 14,000 state and local jurisdictions. In terms of preparing and filing their sales tax returns, the platform provides them with ready-to-print and ready-to-sign tax forms. Because of this, human errors in tax preparation and filing will be prevented. Additionally, Taxify automates the preparation and filing of sales tax returns, as well, as the remittance of taxes that users owe to any state. Thus, they will be able to file returns without the need of using paper-based forms and pay their taxes wherein they no longer need to use checks. Taxify can also work with plenty of eCommerce platforms and apps. Moreover, it supports integration with shopping carts, marketplaces, accounting software, and ERP and POS systems. As a result, users will be able to automatically calculate their sales taxes within the platforms, systems, marketplaces, and apps that they are currently using. If you are interested in Taxify it may also be beneficial to investigate other subcategories of Best Tax Software collected in our base of SaaS software reviews. It is crucial to note that almost no app in the Tax Software category is a perfect solution able to meet all the goals of various company types, sizes and industries. It may be a good idea to read a few Taxify reviews first as some solutions might perform well only in a very small set of applications or be created with a very specific type of industry in mind. Others might function with a goal of being simple and intuitive and as a result lack advanced elements welcomed by more experienced users. You can also come across apps that cater to a broad group of customers and provide a powerful feature base, however that usually comes at a more expensive cost of such a solution. Ensure you're aware of your needs so that you get a software that provides all the elements you search for. How Much Does Taxify Cost? Taxify’s enterprise pricing plan can be availed at a discounted price if you need to manage over 50,000 transactions. Please contact the company for more details, and request for a custom quote. We realize that when you make a decision to buy Tax Software it’s important not only to see how experts evaluate it in their reviews, but also to find out if the real people and companies that buy it are actually satisfied with the product. That’s why we’ve created our behavior-based Customer Satisfaction Algorithm™ that gathers customer reviews, comments and Taxify reviews across a wide range of social media sites. The data is then presented in an easy to digest form showing how many people had positive and negative experience with Taxify. With that information at hand you should be equipped to make an informed buying decision that you won’t regret. What are Taxify pricing details? What integrations are available for Taxify? If you need more information about Taxify or you simply have a question let us know what you need and we’ll forward your request directly to the vendor.